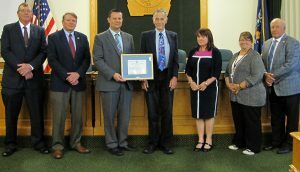 OSWEGO – The Oswego County Legislature’s Economic Development and Planning Committee presented Marty Weiss with a certificate of appreciation on the eve of his retirement after 42 years of service. Following glowing remarks and a standing ovation from the full Legislature, Weiss leaves his post as an associate planner with the Oswego County Community Development, Tourism, and Planning Department. Pictured from left are legislators Paul House, District 8; Roy E. Reehil, District 5; Committee Chairman Tim Stahl, District 20; Weiss; Donna Scanlon, director of community development programs with the Oswego County Community Development, Tourism, and Planning Department; Mary E. Chesbro, District 10; and Morris Sorbello, District 23.